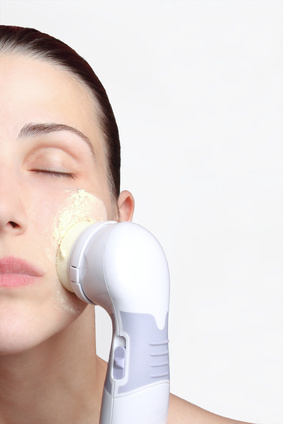 The microdermabrasion treatment is an anti-aging technique that can be compared to gentle sand blasting. The skin surface undergoes gentle abrasion or polishing, to remove the uppermost layer, by using a hand-held device that blows fine crystals onto the skin. This procedure stimulates skin cell and collagen production to rejuvenate the skin. This type of abrasion treatment can take from 30 minutes to one hour. No anesthetic is required. To maximize the benefits of this procedure, a series of treatment sessions (from 5 to 12) are required. These sessions would occur every two to three weeks. Because microdermabrasion is a relatively gentle procedure, this anti-aging procedure may be repeated often in order to maintain the positive benefits obtained in the initial treatment. It is a procedure suitable for all skin colours and types, but individuals with good skin tone usually achieve better results. The microdermabrasion treatment is effective in reducing the appearance or eliminating fine lines and wrinkles, crow’s feet, flaking skin, and for superficial skin defects such as some age spots, acne scars, and stretch marks. It gives the skin better texture and a young, smooth, healthy look. Side effects of this anti-wrinkle treatment are few. Mild redness may be experienced after treatment. Normal activities can occur immediately after the microdermabrasion procedure. The microdermabrasion treatment is a subtle technique when compared to other skin resurfacing procedures. Unlike microdermabrasion, dermabrasion is a procedure that is a lot more aggressive. Basically, a high-speed rotary wheel with a roughened surface (like fine-grit sandpaper) or brush is used to remove several layers of skin. Skin is removed down to the level of the wrinkles (unless the wrinkles are very deep), therefore eliminating or making them significantly less visible. With the removal of the older skin layers, new smooth and healthy looking skin grows. Local anesthetic is used on the area to be treated and a sedative might also be used to make the patient drowsy. General anesthetic is used when the treatment area is large. The dermabrasion procedure normally takes longer than the microdermabrasion treatment and usually takes from a few minutes to about 90 minutes (depending on the extent of treatment) and the full treatment may be broken up into stages. Unlike microdermabrasion, where results are visible immediately, dermabrasion may take from 3 to 6 months in order to see substantial results. However, the benefits of the treatment can last for several years. Healing from the actual treatment is usually complete in about 10 days. This is the amount of time for the skin to form scabs and for the scabs to fall off. Dermabrasion is useful in reducing or eliminating all wrinkles in general and more specifically vertical wrinkles around the mouth. Because it is harsher than the microdermabrasion treatment, it is not performed on the sensitive skin around the eyes. This anti-aging procedure can also be used to remove or reduce deeper imperfections in the skin such as scars from injury, acne and chicken pox. The side effects of a dermabrasion procedure are a little more significant than for microdermabrasion. Redness, swelling, burning, pain, infection, scarring, and excessive bleeding are all possible. Tiny white heads may develop that usually disappear on their own, but may require a visit to the physician. Pores may enlarge temporarily, but return to normal size once the swelling subsides. The pink hue to the skin will take up to three months to reduce to the point where the treated skin will blend in with untreated skin. Sunlight should be avoided for several months after undergoing this procedure, unless the skin is properly protected. Other activities such as swimming, other sports, shaving, etc., will have to be restricted for a few weeks. Keloid healers (individuals that tend to form scars when healing from a skin injury) should not undergo this treatment. Also, individuals with pigmented skin (black skin, Asian skin, other dark complexions) may experience permanent lightening or blotchiness of the skin in the treated areas.